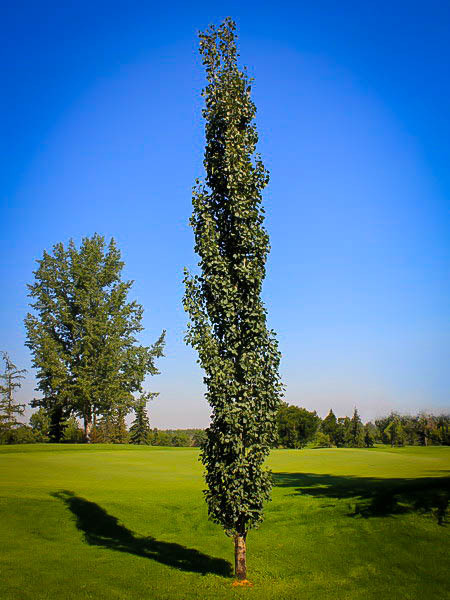 The Columnar Swedish Aspen is a breakthrough in hardy trees for screening, or as a specimen tree. It forms a beautiful, upright column that can reach 40 feet, but it will always remain narrow and so it is ideal for restricted spaces. It is fast-growing, adding a foot or more every year, and its upright form means it never needs trimming to make a dense screen or a beautiful vertical accent specimen. The leaves are red in spring, green in summer and gorgeous shades of gold and crimson in fall. 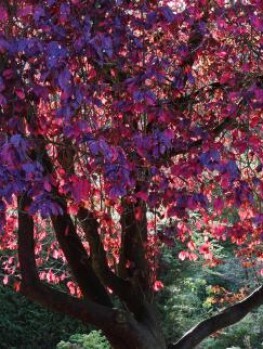 This tree is resistant to pests and diseases and does not produce messy seeds. This tree will grow in any kind of soil and once established it will tolerate both wet soil and long periods of drought. For both beauty and toughness, the Columnar Swedish Aspen cannot be beaten. Its leaves tremble in the breeze, and produce a calm rustling noise you will love. It is remarkable for its hardiness, down to minus 50 degrees, so it is a great choice for the coldest areas, and will thrive in cool or warm regions. 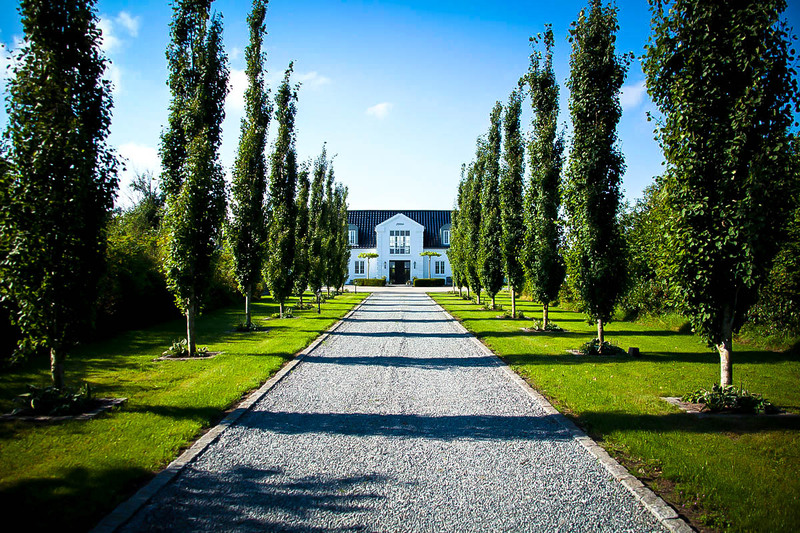 Screening trees are a necessity on many properties, where the use of your garden can be reduced by unsightly views, being overlooked by other buildings, or being subject to strong winds. The ideal screening tree is tall but not wide, attractive and interesting in many seasons, fast-growing, hardy in all soils and climates, drought-resistant and not subject to pests or diseases. That is a lot to ask for, but we have found it – the Columnar Swedish Aspen. 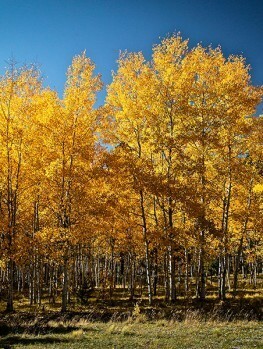 The Columnar Swedish Aspen is a tall, upright tree that can reach 40 feet high but just 10 feet wide. In spring the foliage emerges colored red, and then turns green for the summer – a lovely light, cheerful green. The leaves have a shiny back and glisten in the sunlight and they also produce a lovely rustling sound when even a light wind is blowing. In fall the leaves turn spectacular shades of red and gold, making a great display. This is a fast-growing tree, increasing by a foot a year or more, so it will soon fill-in and become a lovely specimen or screen. As an individual specimen it makes a great accent in your planting, bringing height but leaving room for other trees and shrubs near to it. It also makes a fantastic screen that will give you privacy and wind protection, making your garden much more attractive, warmer and more enjoyable. Because of the narrow width it can be fit into a narrower space than most other screening trees and it also needs no trimming to keep that narrow form. This tree is incredibly hardy, all the way down to minus 50 degrees, but it will also grow happily in warmer zones. It will grow in any kind of soil, from sand to clay and from acid soil to alkaline. It will be happy in wet soil or dry soil too, and once established it will survive drought with no problem at all. 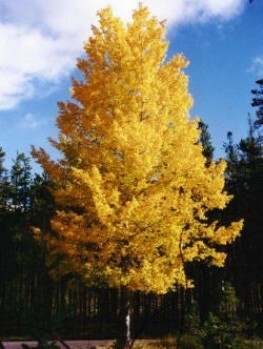 Unlike the well-known Lombardy Poplar, that it is related to, it does not suffer from the diseases that tree can get. 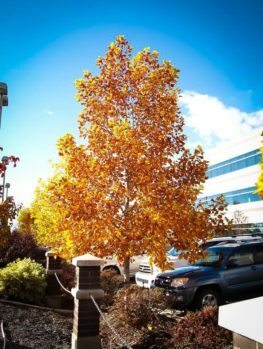 Although it should not be planted close to a building, it also doesn’t have the heavy invasive roots or masses of suckers that other Aspen and Poplar trees do, or produce the fluffy seeds that can be a problem from those trees. To grow your Columnar Swedish Aspen as a specimen, plant 15 feet away from building or sewer lines. 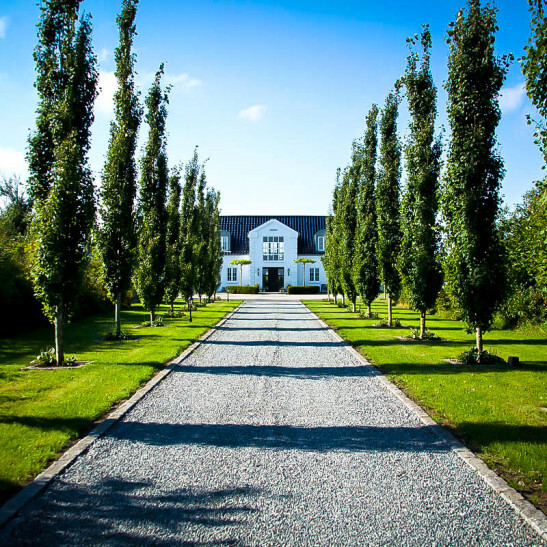 For a beautiful fast-growing screen, plant your trees 4 feet apart in a row, or 6 feet apart in a double row for a very dense screen or to break strong winds and drifting snow. 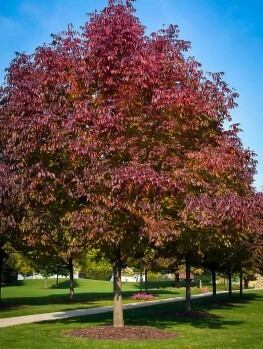 Water your trees well during the first season, but after that they will tolerate drought as easily as they tolerate wet soil or cold – this truly is a remarkably tough and durable tree. The Swedish Aspen (Populus tremula) grows all around the polar regions, from Iceland and Scandinavia, across Russia to Korea and Japan, and also down into Spain, Turkey and Central Asia. With such a wide range, this tree is clearly well-adapted to a wide range of conditions, and that shows in how tough it is in gardens too. It is found growing north of the Arctic Circle, so there is absolutely nowhere in the country where this tree will not grow. The leaves are rounded to heart-shaped, with a toothed edge and they hang down from the leaf stem, which is why they flutter in the breeze, making a beautiful calming sound and flashing the shiny back of the leaf. There are separate male and female trees, with narrow flower clusters, called ‘catkins’ in spring, rather like those on a Birch tree. 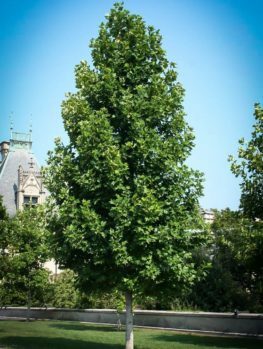 The wild tree can grow to 60 feet tall and 30 feet wide, but the Columnar Swedish Aspen is a form that has been specially selected for its smaller size, which has a mature height of just 40 feet. 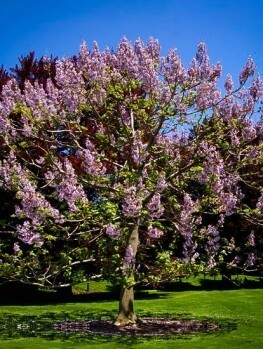 It is also admired for its narrow, upright form, as this tree is only 10 feet wide, even when fully mature. It is a male tree, so it will produce pretty catkins in spring, 2 to 4 inches long, but not the fluffy seeds that female trees produce and that can be such a nuisance in the garden. This special columnar form was found growing wild in the woods of Svalov, Sweden, in the early 1920’s. It was introduced into North America more recently, first in Canada, where it is so valuable for the cold climate, and then, as its virtues became known, down into the US. 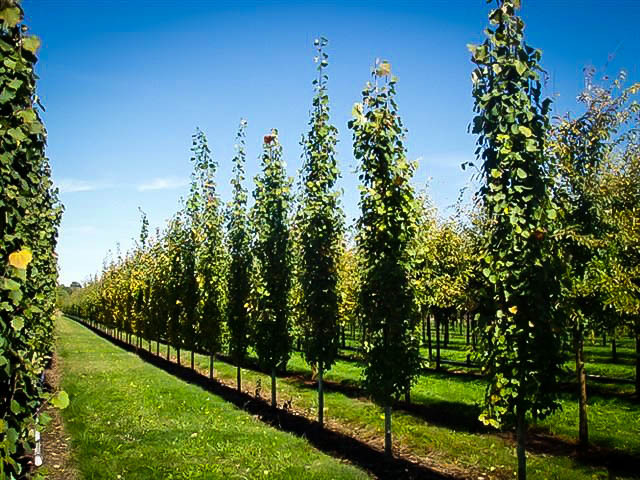 Because this is such a special tree, the Columnar Swedish Aspen can only be grown from stem pieces taken from correctly identified trees, which is how our skilled growers do it. Seedling trees may be cheaper, but they certainly will not be this special form and will grow into giant trees that you will regret planting. 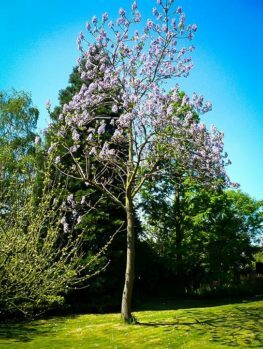 The demand is high for the this tree and we do have a good supply chain, but we cannot guarantee to always have such a popular tree in stock, so for a great screening or specimen tree you will enjoy seeing every day, order now.